Do you like to shop in the heart of Eindhoven? Then Piazza Center is the best place you can be. It’s one of the many shopping malls in Eindhoven with a warm sphere. This indoor shopping mall consists of four floors with great stores and famous brands. This architectural style also makes this place special. It uses a lot of natural light and space, which makes every shopper feel good. Everything in Eindhoven is within walking distance. Piazza Center is located at the 18 Septemberplein, in the centre of Eindhoven. It was developed by an Italian top architect called Massimiliano Fuksas. He goal was to give people a complete shopping experience. The architect has definitely succeeded, because both residents and tourists enjoy this place full of fashion and style. Piazza Center is a great place when you still need to buy some presents for Christmas. You’ll find a wide variety of shops, cafés and restaurants over there. Besides the well-known brands you can also find some specialty shops over there like ‘Pipoos’ and ‘’Ling Ling’. After shopping you can sit down with a cup of coffee and enjoy the bright atmosphere of the shopping mall. Some stores have longer opening hours. Look for different opening hours per store. 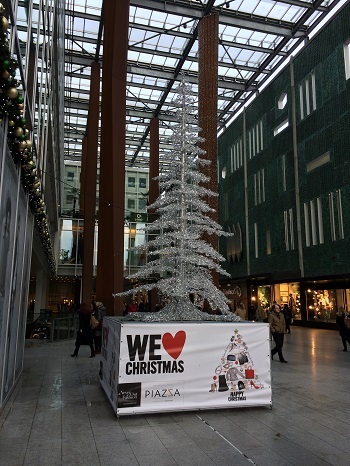 Boxing Day is Piazza Center open from 12:00 to 17:00. In the month of December, several extra opening hours in the evenings and on Sundays. Look for different opening hours per store.